This entry was posted in Brittany (dog), Dog training, Gun dogs, Hera, Hunter safety, Hunting dogs, Pointing dogs, Ruffed grouse hunting, Upland bird hunting, Woodcock hunting and tagged Brittany Hera, Cocotte, Cowan's Corner, grouse, grouse hunting, Hera, Marlborough Forest, Nicholas Marion, Ruffed grouse, Spencerville, training, Woodcock, woodcock hunting on September 25, 2018 by geoffreyandmika. Nick and Cocotte after a good day of upland gunning. Yesterday I took delivery of my 2017 Jeep Patriot High Altitude. I traded in my aging Tucson for the newer vehicle. Just before I left to pick up the new vehicle I checked Facebook and found a message from one of my hunting buddies, Nick, whom I had not seen for three years as he was posted to the Canadian Consulate in New York City all this time. He is back in Ottawa now and contacted me, asking if we could go hunting this morning. I was happy to hear he still has his dog, Cocotte, a German Shorthaired Pointer who is nine years old now. I met Nick at a dog park when Cocotte was a puppy, the same age as my beloved Juno. Cocotte is Nick’s first hunting dog while Juno was my third so I offered to help with her training. We trained our puppies together and hunted them successfully as they grew into young gun dogs until my Juno was felled by cancer at four years old. I happily agreed to take them hunting, they were the first passengers in my new wheels. 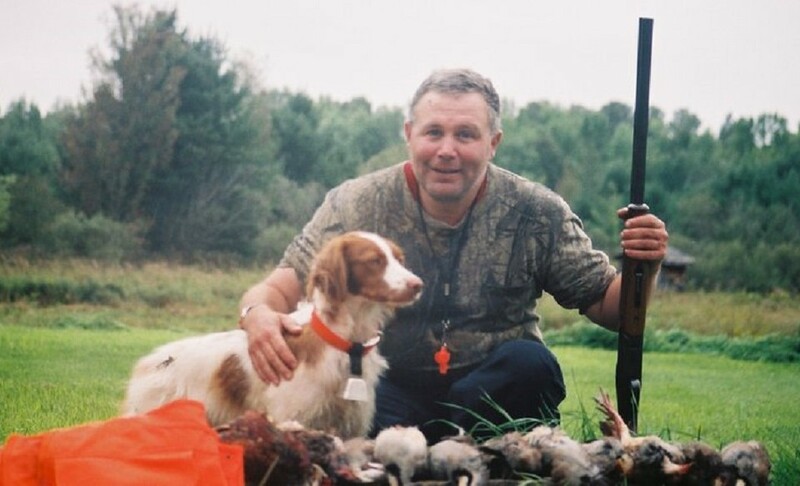 This entry was posted in Brittany (dog), Gun dogs, Hera, Hunting dogs, Pointing dogs, Ruffed grouse hunting, Upland bird hunting, White-tailed deer hunting, Wildlife habitat, Woodcock hunting and tagged Cocotte, German Shorthaired Pointer Cocotte, grouse, grouse hunting, Nicholas Marion, pointing dog, Ruffed grouse, Schäfer's Wood, Spencerville, Woodcock, woodcock hunting on October 28, 2017 by geoffreyandmika. Hera and me after a morning hunt on the Ides of October. What a difference a day makes. Yesterday, I got home from a disappointing morning hunting Hera and felt my enthusiasm for going out the next day evaporate. She pointed woodcock and jumped the gun yet again. I planned on going duck hunting with my hunting buddy Omer, but the threat of inclement weather made him lose interest and he cancelled. My hunting buddy Jason wanted to go out to the farm near Spencerville the next day to add more corn to the bait piles in anticipation of deer season next month and I agreed to accompany him. I suggested we bring our dogs and take them upland gunning before we tended to the bait piles. I wanted to see if there was any change in Hera, whether she would remain staunch on point this time. Jason accepted my suggestion even though the weather forecast called for high winds and light rain. Jason is off to moose camp next weekend and this is our last chance to tend the bait piles before the opening of deer season. I met Jason at his house at 8:00 AM on the Ides of October and off we went to see what fortune would bring. This entry was posted in Brittany (dog), Gun dogs, Hera, Hunting dogs, Pointing dogs, Ruffed grouse hunting, Upland bird hunting, Woodcock hunting and tagged Brittany Hera, cover, deer stand, German Wirehaired Pointer, German Wirehaired Pointer Nos, grouse, grouse hunting, Hera, Jason Quinn, Jefferson Salamander, Nos, pointing dog, Spencerville, staunch, Woodcock, woodcock hunting on October 15, 2017 by geoffreyandmika. Mike with Maggie on an October woodcock hunt. Imagine my dismay this morning when I saw the weather forecast this morning after I got up to take Hera out after grouse and woodcock. Rain and high winds with even higher gusts and unseasonably warm temperatures were forecast for this Sunday morning. This is not good weather upland gunning. I arranged to go hunting with Mike and his eighteen month German Shorthaired Pointer Maggie this morning. I half expected Mike to text and cancel, but he was there waiting at our meeting place, the Old Co-op in North Gower, at 7:40 AM when I drove up. It rained heavily as I put Hera in the car and loaded my gear, but by the time I met up with Mike the rain stopped. The high and gusting winds continued unabated and I knew this would be an issue. High winds make grouse skittish and also make it difficult to keep track of your dog. The sound of the gusting wind drowns out the sound of the cowbell on the dog’s collar. I anticipated this hunt would be more of an armed run than anything else you never know what fortune brings. This entry was posted in Brittany (dog), Dog training, Firearms, Gun dogs, Guns, Hera, Hunter safety, Hunting dogs, Pointing dogs, Ruffed grouse hunting, Shotguns, Upland bird hunting, White-tailed deer hunting, Woodcock hunting and tagged Brittany, Brittany (dog), Brittany Hera, German Shorthaired Pointer, grouse, grouse hunting, Hera, Lester's Square, Maggie, Marlborough Forest, Mike, pointing dog, Ruffed grouse, Schäfer's Wood, Woodcock, woodcock hunting on October 8, 2017 by geoffreyandmika. Hera during a break in our morning hunt at the Marlborough Forest. Hera turns five next month and by and large is a seasoned hunting dog in her prime. I remember how impressed I was with her when she pointed grouse and woodcock in her first season in 2013 when she was barely a year old. The other three Brittanies who came before her did not make their first points on wild birds until they were in their second seasons and closer to two years old. Hera started her career as a hunting dog on a firm foundation, but in her second season she took to breaking point and bumping birds before I could walk them up. This proved frustrating for me, but I was patient with her and over time I got her back to remaining staunch on point. She was fine in her third season and her performance last season was superb. She remains staunch on point on woodcock she finds in the fields I run her every day through the year. Typically, she finds woodcock in these fields early in spring. They are migrants returning from their wintering grounds. Imagine my dismay that now, in her fifth season, she experienced a relapse and took to breaking point again. This entry was posted in Brittany (dog), Dog training, Gun dogs, Hera, Hunter safety, Hunting dogs, Pointing dogs, Ruffed grouse hunting, Upland bird hunting, Wildlife habitat, Woodcock hunting and tagged Brittany (dog), Brittany Hera, grouse, Hera, Lester's Square, Marlborough Forest, Nick Schäfer, Ruffed grouse, Schäfer's Wood, Woodcock on October 1, 2017 by geoffreyandmika. Jason posing with a grouse he took on our morning hunt with Hera and Nos. This entry was posted in Big game hunting, Brittany (dog), Firearms, Gun dogs, Guns, Hera, Hunting dogs, Pointing dogs, Ruffed grouse hunting, Upland bird hunting, White-tailed deer hunting, Woodcock hunting and tagged Beretta, Beretta SV19 Perennia III, Frances Quinn, Franchi, Franchi Instinct SL, grouse, Hera, Jason Quinn, ladder stand, Nos, porcupine, Spencerville, white-tailed deer, Woodcock on September 30, 2017 by geoffreyandmika. Hera at the end of a full morning of hunting grouse and woodcock. Got out for the second time this week with Hera to chase some grouse and woodcock. This time it was a solo hunt, just Hera and me on our own. I set out for the farm near Spencerville shortly after 7:00 am, but had to double back when I realized I left my phone at home. After retrieving my phone we were on our way and arrived at the farm at about 8:30 am. The temperature was 5 C and there was no wind. It looked like a good day in the field was in store for us. My enthusiasm soared when seconds into the hunt Hera locked up on point. It was at the edge of a trail in a dense stand of aspen and evergreens. I searched for a way through the cover to approach Hera head on, thinking it might be a grouse. I pushed through the cover and a woodcock flushed, climbing through the brush to the right of me very close. I turned as quickly as I could and got off a shot, missing spectacularly. It was a challenging shot so I took it in stride, buoyed by the fact that Hera found and pointed a bird so quickly. However, what followed left me bewildered and a little dismayed. This entry was posted in Brittany (dog), Dog training, Gun dogs, Hera, Hunting dogs, Pointing dogs, Ruffed grouse hunting, Upland bird hunting, Woodcock hunting and tagged Brittany, Brittany (dog), Brittany Hera, Cowan's Corner, grouse, Marlborough Forest, pointing dog, Ruffed grouse, Spencerville, upland gunning, woodcock hunting on September 29, 2017 by geoffreyandmika.